101217-We’re at the UFOHQ this Fri and Sat . . . I know it’s a been a very stressful week for everyone, for some more so than others. I’m glad to hear that most of our ‘Ohana has been making it “ok” through the Fire Storm. “Standing Tough! But Scared,” says Faith Ako. I know it’s far from over, so let’s keep praying to our higher powers to keep everyone safe and for those affected, a speedy recovery. I know that for Betty Ann and Craig this is their “second time around”, they were also victims of the Oakland Fire. Please send them, and our ‘Ohana up North, lots of positive mana, in hopes their homes and lives remains intact. I know it was that same mana that brought home Jake. Mahalo to you all for that and to Gary, Melann and Pauline for all the help with posting (and un-posting) the Lost Jake posters. So this Friday, the 13th, we’re at the UFOHQ, 7p-10p, BYKaukau (Potluck), BYODakineMusicStands and as always, you know, Bring that “A” word thing! Since we’re speaking of Fridays, click here for the photo album from last week. We’ll be back at the Elks next week Friday, October 20, at our usual time. We’ll be celebrating Joe Tato’s “Homecoming” and there will be a special dinner available as well. Mahalo to the Elks for inviting us to participate in this special event. This Saturday, the 14th, we’ll be back at the UFOHQ again. Same time as usual, 2p-4p. BYOB&Snacks if you need something to munch on. Click here for Saturday’s images. Next Saturday, the 21st, we’ll be holding Kanikapila at the UFOHQ-ANNEX. Text me at 415-300-7804 or email me at kaleikoa@piko.ws if you need directions. Run time will be 3p-5p. After 5pm we will be holding a super combo “Not So Surprise” Birthday party & CD Launch party for our own Bass Commander Sandy Bailey. Marion will be graciously providing Onolicious food from Maunaloa Hawaiian BBQ, BYOBeverage and BYOVegetables if you’re . . . well, you know, if you’re into that sort of thing.
. . . i’m back . . .
We’re hoping he’s just on vacation, but please, do call the number above or send me an email if you have any information. Please feel free to spread the word about Jake. So Friday, we’ll be starting at the usual time of 7pm, running till 10pm-sih. BYPotluck, Music stands, etc. and as usual, some Aloha to share with your UFOhana. Then Saturday we’ll do it all over again, 2p – 4p. Except BYOBeverage&Snack (if you like). A big mahalo nui loa to Craig and Linda for the great photos and to John, Lois, Carolyn, Linda, Clay and especially Laura for helping out with the Band Duties! You folks sounded great! Couldn’t of done it without you all. 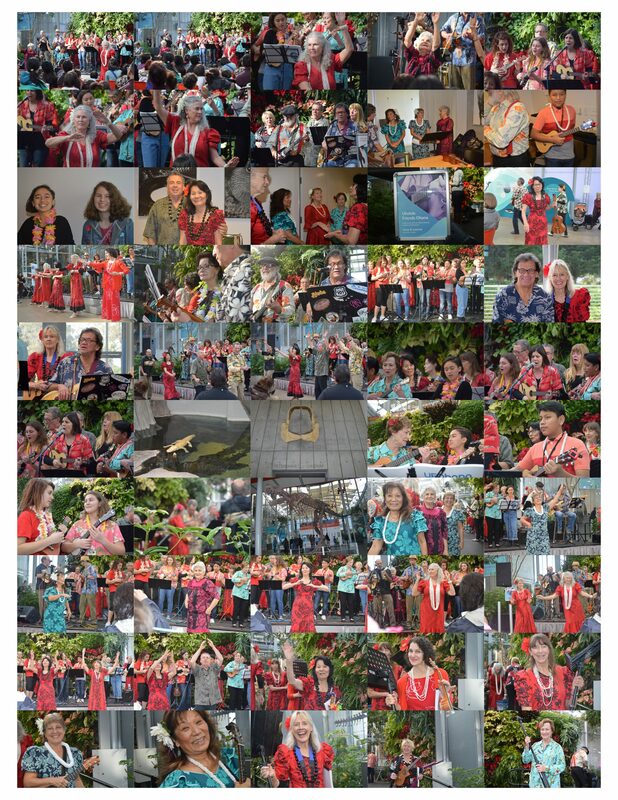 Of course an even bigger Mahalo Nui to the Sonoma Valley Woman’s Club for hosting us and to Hula Mai for all the great hula and support of the Kanikapila. Lastly, Mahalo Lou for setting up the chairs! Ok, we’re going to take one last look around for the little guy. Hope to see you folks around! Little minds scheming . . .